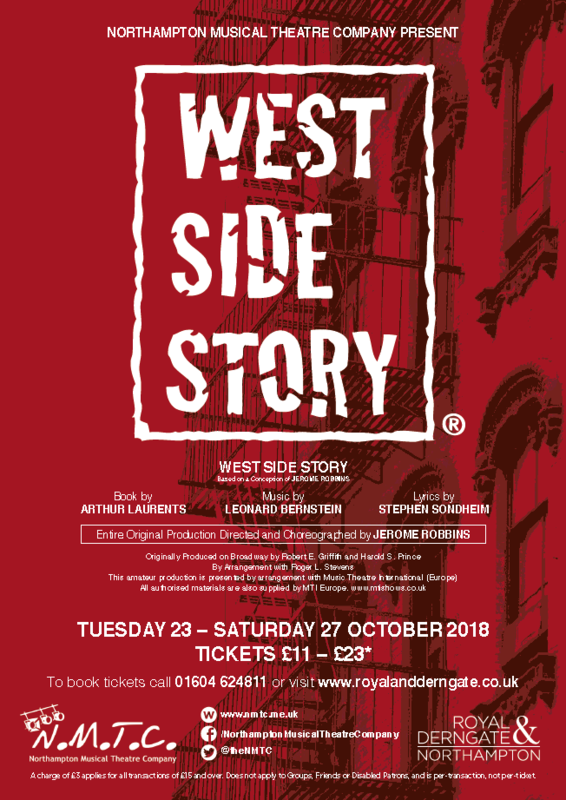 Taking over the famous Royal & Derngate theatre this month, Northampton Musical Theatre Company’s performs an American take on Shakespeare’s Romeo & Juliet with Bernstein and Sondheim’s classic, WEST SIDE STORY. Join us this half term as Tony and Maria become caught between two rival street gangs, The Jets and The Sharks. Their story of trying to find love in the midst of a prejudiced and brutal city is still a painfully relevant piece of musical theatre today. Featuring a full soundtrack of well-known, including America, Tonight, I Feel Pretty, and of course, Maria, you will leave the night unable to stop humming the tunes! The original Broadway production was nominated for six Tony Awards, and the 1961 film adaptation won 10 Oscars. 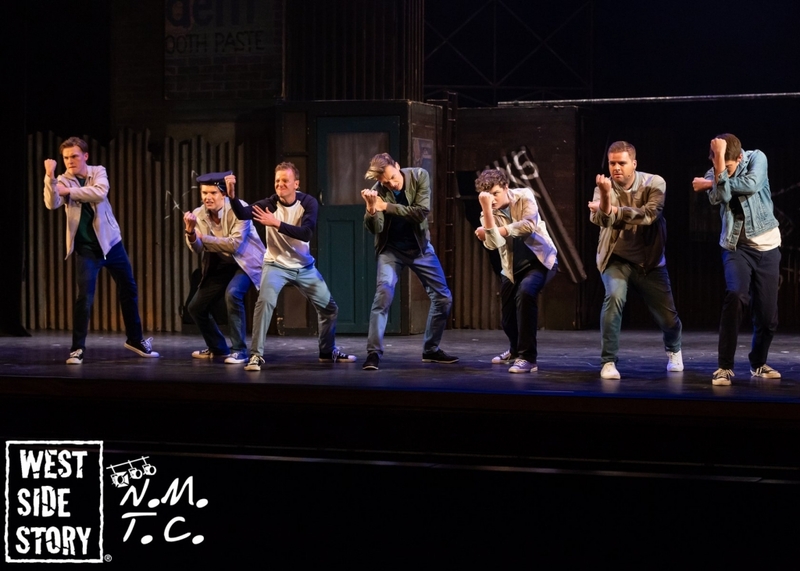 When it comes to musicals in my district (and our region), Northampton Musical Theatre Company (NMTC) is the business, the big boys! This long running concern stages all the well-known musicals every year and does so to a professional standard. With this in mind, I was very much looking forward to my first visit to NMTC as its NODA representative, and in the entire this maiden visit did not disappoint. 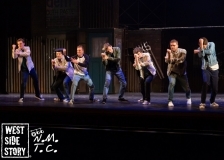 NMTC was, for the first time in its very long history, staging West Side Story. The music is, of course by Leonard Bernstein and the lyrics are by Stephen Sondheim. 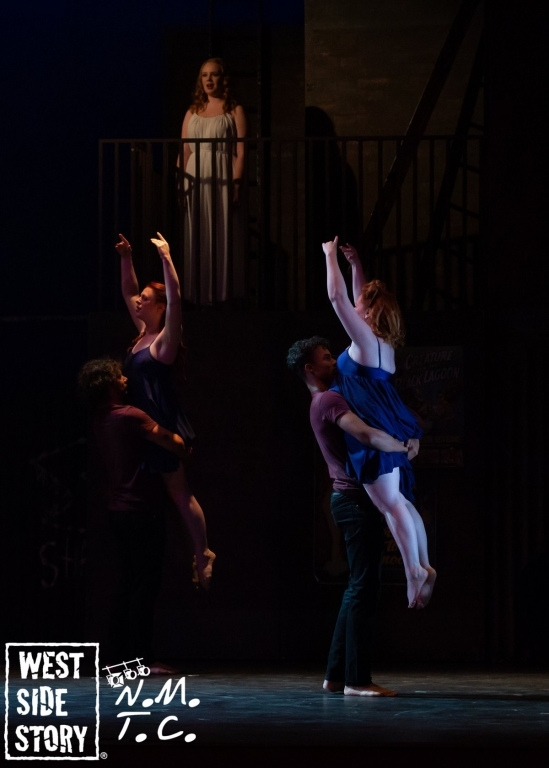 I must confess that I do not like West Side Story – in fact I really dislike it. The score is not one that I enjoy. Whilst I am not a fan of the music or songs, I can fully appreciate this love story – the greatest of all time, that of Shakespeare’s Romeo and Juliet, albeit shifted to 1950s America. The messages sent to the audience, of a disengaged generation, of gang violence and of the need to recognise love is as relevant to day as ever. Despite my dislike for this musical, I attended the performance with an open mind ready to be impressed by NMTC’s interpretation. Martyn Knight directed the show and Graham Tear took on the task of musical director. The pair did a very good job with the principal and ensemble cast – the show was well blocked and ran with ease. The vocals were of a good to high standard, with some reaching the level of outstanding. 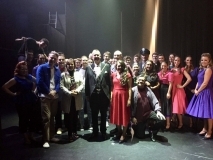 Being a dance musical, the dance captains had their work cut out, and in the all they did a very good job – although some of the movement seemed laboured. I congratulate Gordan Ritchie on setting the fight scenes – these were all excellent and done to perfection. 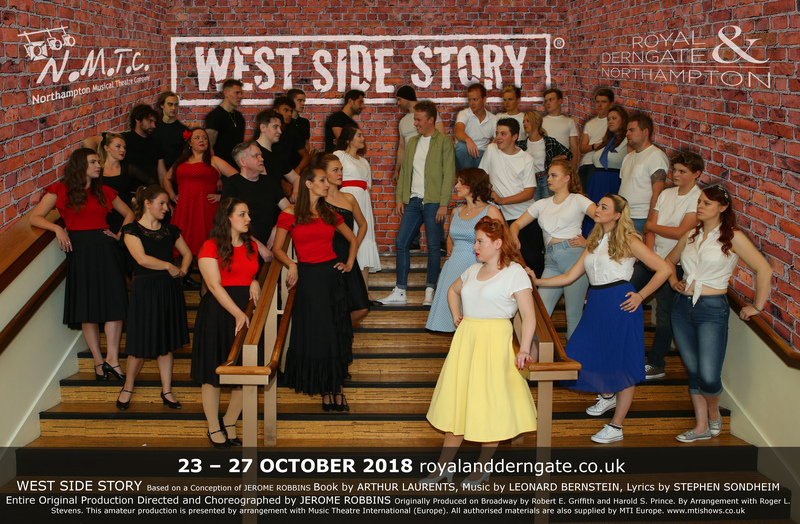 To take on West Side Story is a massive challenge: not only do you have to have a company that can sing and act, you have to have very impressive dancers. In the whole the members of the cast demonstrated skills in all three areas. The principal list is long and the company even longer, as such, I cannot mention you all by name, but I will say this: each and every one of you worked exceptionally hard and impressed me with your characterisation, execution and discipline. Special mentions must go to Amanda Giuliano as Maria, Susie Pack as Anita and Ama Scuotto as Bernardo; you all impressed me very much with your performances and vocals. I must also acknowledge the work of Matthew Broome as Chino, Brett Hanson as Doc and Ella Styles as Anybodys. Finally, the beautiful voice of Hannah Jarvis must be noted – it moved me. Despite my dislike for the score, I enjoyed a number of the songs and scenes that accompanied them. The highlight of the evening, however, was the final scene – the outstanding acting on stage brought me to tears, and many around me also – you silenced the audience in the way that only excellent acting can. The set was of a high standard. The lighting was simple yet effective and costumes were well selected and added to the production. Sadly, the technical team were clearly having a number of issues with sound, with microphones not working, coming in and out or being left on; this was a real shame but unfortunately detracted from the overall professional standard. 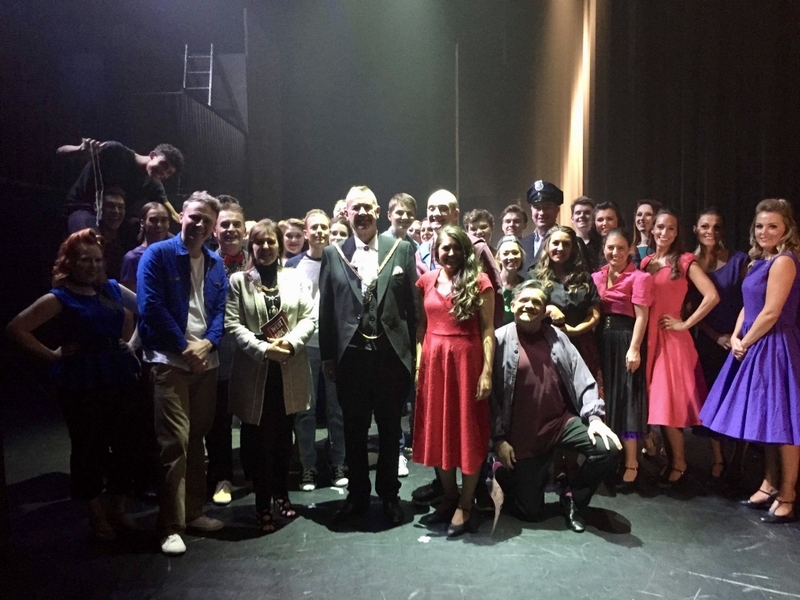 I want to congratulate you all on a solid performance of West Side Story, you have all clearly worked very hard and should be proud of what you have achieved, and you can take comfort in the fact that you made me – someone that dislikes the show – smile, laugh, cry and even sing the songs in my head the next day. Thank you for the hospitality shown to my guest and I, and I look forward to seeing your next production. The curtains come up on a simple but effective set evoking the Upper West Side New York, and we are quickly introduced to the two rival gangs the Jets (White Americans) and the Sharks (Puerto Rican Americans), through the medium of dance. 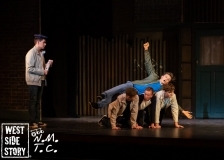 The choreography is reminiscent of the original balletic influences of Jerome Robbins and instantly recognisable in the use of clicking and gesture. Riff, played by Gordon Ritchie, rallies the gang in the opening number of the show, to evict the Sharks from their neighbourhood. Ritchie’s powerful voice and clear New York accent, really captures the almost caricature like gang leader, ready to do anything for his turf. Tony (Sean Page) is immediately identified as being separate from the other Jets by the change in location – we are introduced to Tony’s dreams for a different life outside the gang, but also his feelings of obligation to his friends. Page’s acting and singing in this opening number for his character is indicative of his performance throughout, his vocals are lovely if a little soft, and his emotions are clearly expressed through his careful facial expressions. He is endearing to watch and really captures the essence of youthful naivety that comes with the character.